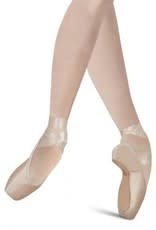 Capezio's Concerto pointe shoe features an elegant U-throat and a very slim profile. The medium-strength shank, with its faster break-in allowance, is comfortable to most dancers. Its stable platform will help you rise up quickly.